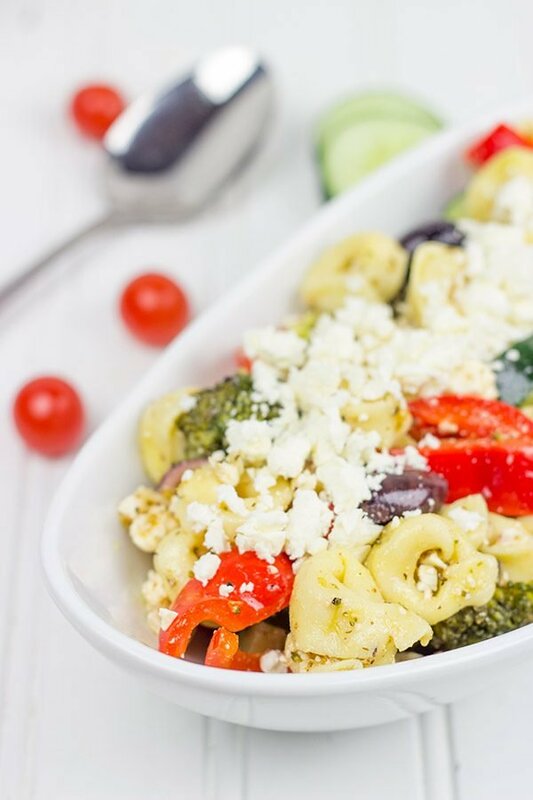 This Greek Tortellini Pasta Salad is loaded with all of your favorite Greek salad toppings…and it’s perfect for summer picnics! Back before I started writing Spiced, I taught high school Latin for a couple of years. I truly love the language, and I do miss teaching. But that’s not what this post is about. 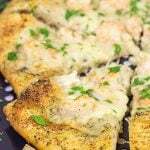 This post is about the part-time job I had coordinating cooking classes for a local kitchenware store. By day, a Latin teacher. By night, a cooking class coordinator. It was a fun gig for a while, and I got to meet a lot of chefs from local restaurants. But one day on a whim I reached out to Suvir Saran, a very accomplished chef who was the executive chef at the first Indian restaurant in the States to earn a Michelin Star. (If his name sounds familiar, he competed on Top Chef: Masters back in 2011.) Well, it just so happens that Suvir lives on a farm in upstate New York not too far away from where we live. I figured getting him to teach a class would be a longshot, but it was worth a shot, right? So you can imagine my surprise when Suvir agreed to teach 2 classes on Indian cooking! Those 2 classes came with a small catch, however. He asked me to prep all of his ingredients so that he could spend the time in class talking with the students. That’s cool. I didn’t mind. After all, the chance to work with an internationally acclaimed chef doesn’t come around all that often! But then I realized exactly how much prep work Indian cooking entails…especially when you are cooking for 25 people. (Oh, and we had 4 different dishes on the menu that night.) I had bowls of chopped herbs and containers of exact measurements of spices lined up all over the place. I even employed my wife’s assistance the night before his classes to help measure and prep anything that could be done in advance. But all of the chopping, dicing, mincing and measuring paid off. Suvir was an incredible teacher, and his food was nothing short of delicious. It was obvious why his restaurant down in NYC earned such high acclaim. During the class, I sorta became Suvir’s sous chef. He needed someone to watch a pot while he got to work on another dish. At one point, he asked me to taste one of his dishes and tell him what was missing. That’s all fine and good…until you realize that I didn’t grow up eating Indian food. My wife knows Indian food, but not me. I almost died when he asked me to taste his cooking and critique it…in front of a class of 25 students. I looked at my wife (who was in the class), and she just started laughing at me. But it all worked out. Turns out his dish was perfectly seasoned. Phew. I have great respect for Suvir not only because of his accomplishments in the kitchen, but also because he followed his passion and made a career out of it. He studied visual arts in both India and the United States, but he left that world to follow his passion for cooking. My personal background is in higher education administration and specifically college athletics. 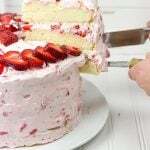 As much as I love the strategy involved in the world of higher education, I love cooking and baking more. It took a lot of debate and soul-searching (and a bit of a leap of faith), but that’s how I started Spiced. And I don’t regret it one bit! I’ve met (both virtually and in-person) so many incredible people so far, and I can’t wait to see where this little corner of the internet eventually leads. But enough of that sappy stuff. Let’s talk about food. 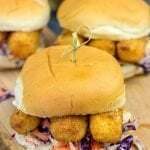 More specifically, let’s talk about delicious food. 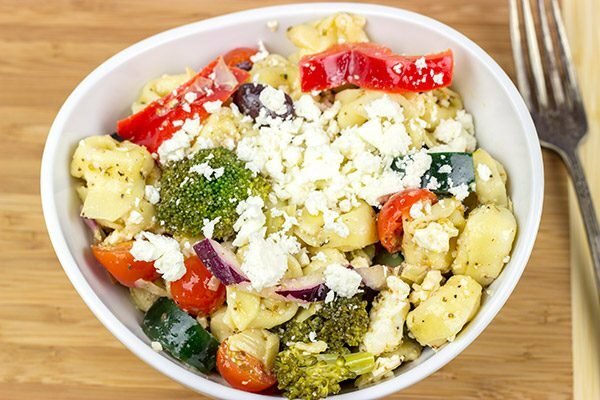 Like this Greek Tortellini Pasta Salad. We love eating outdoors in the summer, and tasty pasta salads are a staple in our refrigerator throughout these warmer months. 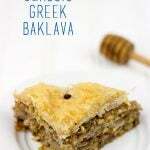 For this salad, I was inspired by the classic Greek salad (one of my favorites). Instead of lettuce, I used tortellini and then added all of the tasty toppings that we typically find in a Greek salad. Cucumber, olives, tomatoes, feta. I’m pretty sure an antipasti platter loaded with those toppings could qualify as a meal! I also added some marinated artichokes, broccoli and red bell pepper just because. 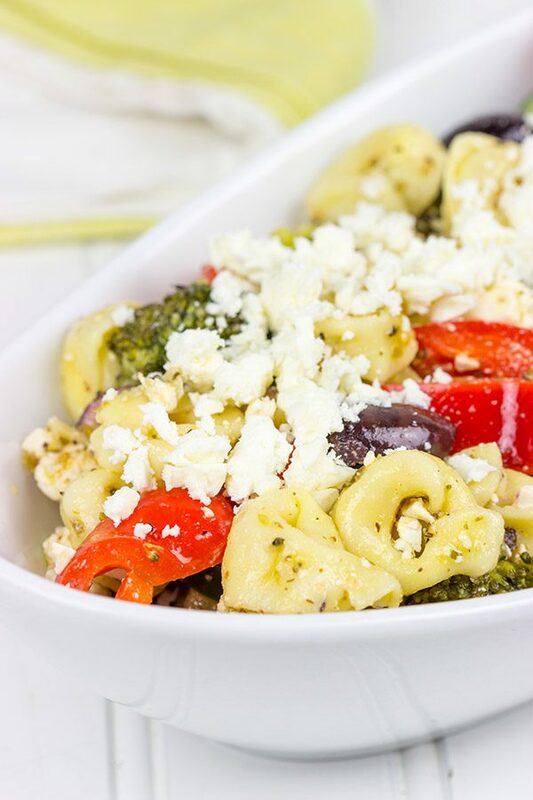 This Greek Tortellini Pasta Salad is one of those delicious summer pasta salads where you don’t know what part to eat first. Do you just go all in and get a fork full of everything, or do you go through and pick out each delicious bite individually? So here’s to grilling on the back porch, delicious summer side dishes and following your passion! 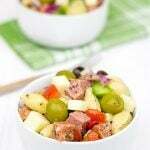 What’s your favorite part of a Greek salad? Cook the tortellini pasta according to the package instructions. Rinse and drain the pasta in cold water. Meanwhile, blanch the broccoli florets by placing them in a pot of boiling water for 90 seconds and then immediately rinsing them in cold water. Drain blanched broccoli well before adding it to the pasta salad. 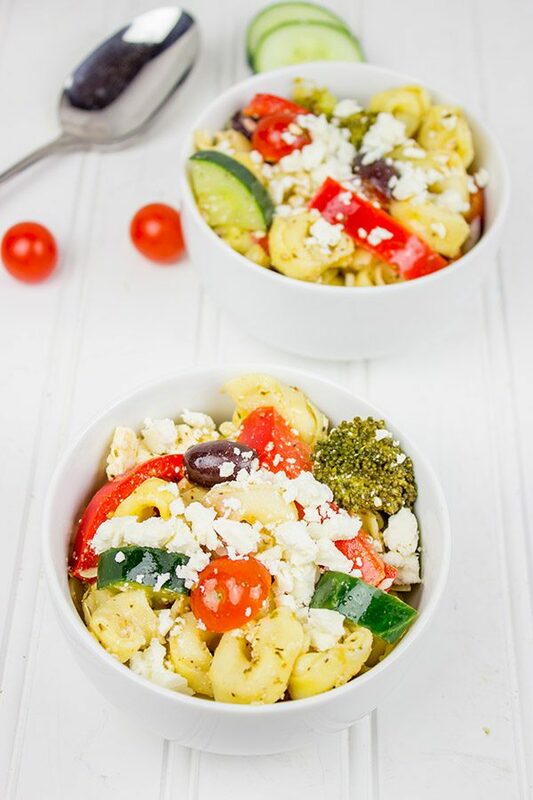 Transfer pasta to a large bowl and add remaining ingredients (cucumber, broccoli, tomatoes, bell pepper, marinated artichokes, onion, olives and feta). Stir until well combined. 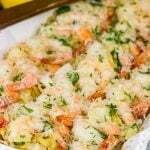 In a small bowl, whisk all of the ingredients together. Pour dressing over salad and stir until well combined. Keep pasta refrigerated; serve cold. Yeahhhhh Feta! Always happy to see feta. I think it takes huge courage to take a leap and to something you are passionate about. But, if you never try, then you will never know. I gave up a job to go full-time with Hungry Healthy Happy and it was so scary and it hasn’t always been easy, but it has definitely been fun. Dude you should have started a food blog in Latin. Can you imagine? OK, enough with this non sense. Let’s focus on this delish pasta salad. So much flavor, so much goodness, a slam dunk! OMEEEGAWSSHHH – I just let out a high-school-girl-squeal when I read that Suvir Saran lived near you! Next time we are in NYC – I am gonna have to drive up and (do what your neighbor does) and go mow the farmland next door and hope he invites me over to taste his cooking! David – that is so awesome you got to be his prep/sous chef – even though you were not into Indian food back then (P.S. I hope Mrs. Spiced has since convinced your tastebuds to crossover)! BTW – this salad sounds fabulous -so many of my favorite flavors- though I might have to keep the lettuce in! P.S. – sometimes, sappy stuff is good you know! 🙂 Have a wonderful weekend! 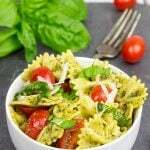 I love me some green pasta salad. . the cooking class coordinator job sounds so fun and looks like it led to great things! so cool that you got to work so closely with Chef Suvir Saran. . and that’s so awesome that that inspired you to start this blog! love hearing stories like this! How cool to have Suvir teach classes for you. I wouldn’t have minded being his sous chef either! Mise en place for 25 – wow, go Dave! As for this salad, I am a big fan of tortellini, hot or cold. Great flavors going on here, especially the marinated artichoke addition. Have a great weekend! And I have a background in medicine, it’s funny and fascinating how unpredictable life can get! 🙂 Loved reading about your Indian cooking class experience! And the salad looks fantastic! This looks awesome- I love marinated artichokes and broccoli 🙂 Pinning! Hahaha…I couldn’t agree more, Valya! Thank you! Love life! Anything happens all the time, so glad you followed your passion and started Spiced. This Tortellini pasta, I so pinned it the flavor elements have my mouth salivating! The flavors in this pasta salad are quite tasty, Tonya. We have a lot of favorite summer pasta salads, but this one is up there on the list. And thank you so much for the kind words! You never know where life will take you…you just might end up writing a food blog one day. Haha! It’s oh so wonderful when you can do what you’re truly passionate about in life. I’m currently trying to decide to take that leap of faith and work my blog full-time, it’s a scary thing. 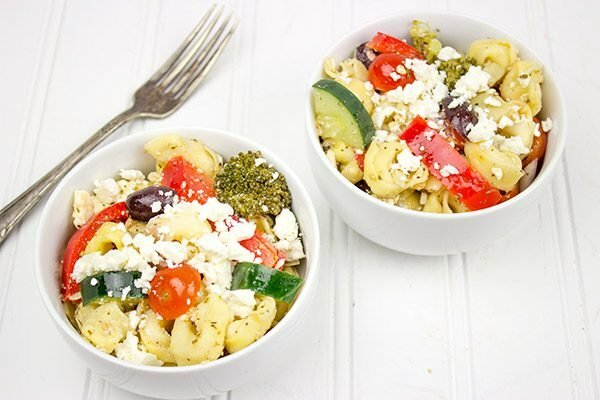 This salad looks so delicious, my favorite part of Greek salad is the combination of olives, cucumbers and feta, however, I love the addition of tortellini. Making the leap is not easy, Celeste…but I’m so glad I did it! Writing a food blog as a full-time job is definitely not for everyone, but I kind of enjoy working for myself and setting my own agenda. Plus, I love eating lots of pasta salad…so it’s a win-win! Haha! “I’ve met (both virtually and in-person) so many incredible people so far, and I can’t wait to see where this little corner of the internet eventually leads.” Mate, you also met God. Hi! Oh man, I wish I was in that class- I am obsessed with Indian food and what an experience that would have been. I’m so glad you took the leap of faith and inspired others that it can be possible. I’d say thank in Latin but I am stumped to you can have it in German. Danke. And this salad- Greek + Tortellini- I feel like this post is the United Nations in Blog form. Haha…I love that you described this post as the United Nations of blog posts. I didn’t set out to write it that way, but I guess it kinda is true. It’s funny how life takes you in different directions. I mean, 5 years ago, I would never (NEVER!) have expected to be writing a food blog now. But it’s fun. And if it’s fun, then I say do it! David, you should definitely write a post in Latin one day. I bet most of us won’t understand a single word, but at least you can reminisce about the years you thought the language. Just provide us the translation in the following post:) Talking about this salad, it’s cool! I do love pasta salads too, but I’ve never used tortellini. That’s genius. But worse, David, I haven’t made any pasta salad this summer. Horrible, right? Please, don’t ostracize me from your company.